KC High Grade 3 Dynamic Dolphins (DDs) became Archaeologists during their trip to the Sharma Centre for Heritage Education. The learners started their exploration with a presentation on the Indus Valley Civilisation, which was compared with the Egyptian and Chinese. They moved to the field, to excavate a burial site using tools, the hand shovel and brush to find pottery, beads, jewellery, parts of a well, skeleton, clay baked bricks, the bronze dancing doll, and tools. They then flagged their excavations and moved on to know more about the lost wax casting technique, which was used for making bronze sculptures like the bronze dancing girl. They got to see how a metal smith used the bellow to increase the temperature in a small furnace as a part of this technique. All of them got to use the bellow, which was quite exciting. Making seals and clay models was the next area of exploration. The learners got busy using their hands in making seals and engraving into them pictograms, making small clay models of their choice like the Indus Valley people. Being a part of this civilisation, copper foils were made available to them; using a nail and small hammer, they embossed images, they could replicate from the pictures of the seals that were on display. They hammered along and got busy using their imagination and came with new copper seals for the DD Age. There outside the craftsman’s cottage was the potter busy at the potter’s wheel. The learners got to make their own small pots and bake them in the sun. 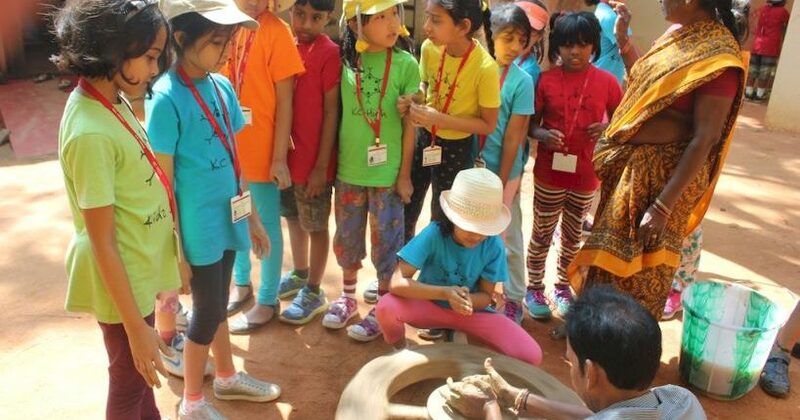 After learning so much about the Indus Valley civilisation, the learners were divided into groups of six and were asked to develop their own Harappan civilisation and to title the display model as ‘My Harappan Civilisation.’ The Indus Valley civilisation was also known as the Harappan Civilisation. The Potter Uncle on the wheel was very courteous to make small pots for each group to place it in their display models. The learners carried their individual and group model displays back to school and cherished every moment of being an Archaeologist and one among the people of the Indus Valley.